As we enter is the busiest part of the recruiting cycle, it’s easy for members of the admissions staff to get swept up by so many activities and tasks that they lose sight of anything beyond what they are supposed to do today. Or right now! Stress mounts. Productivity can suffer. Activity can be confused with accomplishment. Creativity and thoughtful planning can be jeopardized at a point in the recruiting cycle when it is most needed. Regardless of how busy you get, time must be set aside on a daily, weekly, or monthly basis to assess where we are, where we are going, and how best we can get there. A few years ago, I found a wonderful way to plan and be creative when times are busiest. It’s called mind mapping. It’s a process that enables you to diagram your thoughts, ideas and plans very easily and connect all of those elements in a way that helps you visualize how all things are connected toward reaching a common goal. You can mind map something as finite as a campus event or as expansive as your year-long enrollment management plan. Creating a mind map is easy. Anyone can do it. Everyone should know how. It’s a tool that enhances productivity and creativity. I cannot think of anyone in an admissions office who would not benefit from it. Mind mapping can help an admissions processing clerk contribute new ideas for minimizing incomplete applications. It can aid admissions counselors in honing strategies and tactics for managing their territories. It can help campus event organizers plan successful events down to do very last detail. We have clients that use mind mapping as a tool to aid all department members in creating plans and sharing them with others. By sharing, everyone can see and understand the goals, strategies and tactics of co-workers, and see how they connect to them directly or indirectly. This promotes collaboration, understanding, sharing of ideas and a host of benefits that enhance teamwork. You can draw a mind map on a cocktail napkin or use a computer program to draw one. 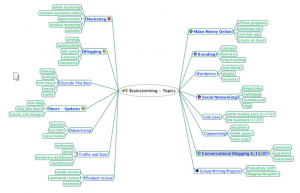 There are a number of free programs available for creating mind maps. I recommend an open source program called FreeMind. The program (available for all operating systems) not only enables you to easily draw a mind map diagram, it also allows you to transform and export the map into a text-based document for editing in Microsoft Word or similar applications. With as much as you have going on right now, there is no way that I would introduce a new tool or task that didn’t promise as much as the process of mind mapping promises to enhance productivity and effectiveness.